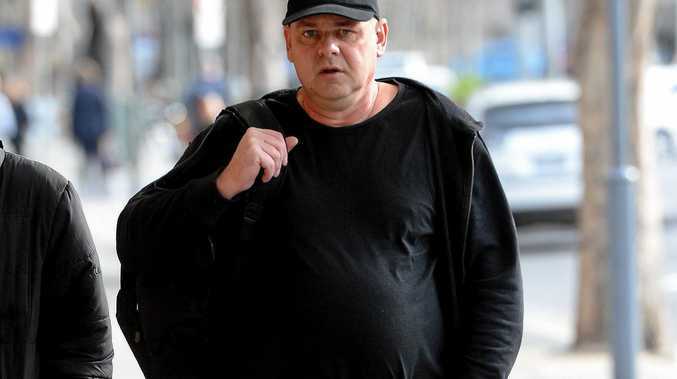 A GRUBBY house was the trigger for an ugly twist to an online romance after a man drove 2000km to move in with his Ipswich lover. An Ipswich court has heard a woman was accidentally stabbed in the breast while coming to the aid of her beloved dog, which the man attacked with a knife. Ipswich Magistrates Court heard John Alexander Kiss travelled from Adelaide to Ipswich to move in with the owner of Toby the dog. Kiss, 49, who appeared in the dock, pleaded guilty to assault causing bodily harm to the woman when armed at Rosewood on December 29, 2017; wilfully wounding an animal by knife; and two counts of obstructing police officers. Police prosecutor Senior Sergeant Rebecca McDonald said Kiss had been held in custody nearly four months. She said police received a Triple-0 call and went to the home where Kiss was found heavily intoxicated and lying on a couch after drinking vodka. Sgt McDonald said the incident would have been terrifying for the woman and "it could have gone terribly wrong". The woman received a laceration to her left breast, while the dog ended up with a stab wound to its side. She said police offers trying to arrest Kiss had to present their guns and a taser because of his behaviour. Police sought a jail term and $466 compensation to cover vet costs for Toby the dog. Sgt McDonald said Kiss had a history of violence in South Australia including threatening life, and at the time of the Queensland offence was subject to a suspended sentence. Defence lawyer Zara Rudan said Kiss was diagnosed with post-traumatic stress disorder following the death of his mother in 1982. Ms Rudan said Kiss met the Ipswich woman online in 2009 and this was the first time he'd visited her. He had been at her home only nine days. "It was in disrepair and there were some tensions about rubbish and there were a lot of animals," she said. Ms Rudan said their voices were raised arguing and her dog bit him on the back of his legs. Kiss got the knife and stabbed the dog in its side in an attempt to get if off. She said he immediately co-operated with police and dropped the knife - "he didn't realise guns and tasers were drawn". Ms Rudan said Kiss would return to SA. Magistrate Louisa Pink sentenced Kiss to 115 days' jail for the assault causing bodily harm, and with time served released immediately to parole. He was sentenced to six months' jail for deliberately wounding Toby the dog - suspended for 12 months. Kiss was ordered to pay the woman $466 for vet fees.